So says Dr Caroline Leaf, communication pathologist and self-titled cognitive neuroscientist. Her Facebook factoids have varied in their quality lately, ranging from the almost reasonable, down to the outright ridiculous. Today’s contribution rates an 8.5 out of 10 on the pseudoscience scale. The reason why it rates so high is for the same reason why many of her factoids, and indeed nearly all her teaching, rates the same: Dr Leaf has the relationship between the brain and the mind back to front. Dr Leaf squarely puts the proverbial cart before the horse. One would think if you were going to claim to be a cognitive neuroscientist, you would at least get the basic facts right. But Dr Leaf’s teaching, from her first book through to her last, is based on this idea that it’s the mind that is in control of the brain, hence why she thinks that thoughts can be so toxic. Dr Leaf’s entire teaching heavily rests on her fallacious assumption that the mind is in control of the brain. Thoughts are only important if the mind controls the brain. Toxic thoughts can only affect our health if the mind controls the body. Controlling toxic thoughts is only worthwhile if our mind can influence our brain and body in positive or negative ways. The problem for Dr Leaf is that there is no credible scientific evidence that the mind controls the brain. The only evidence she does tend to proffer is based on the work of other pseudoscientists, or she misinterprets or misquotes real scientific data to fit her erroneous working theory. For example, Dr Leaf refers to a paper titled, “Local and nonlocal effects of coherent heart frequencies on conformational changes of DNA” . She says that this paper is, “An ingenuous experiment set up by the HeartMath Foundation (which) determined that genuine positive emotion, as reflected by a measure called ‘heart rate variability’, directed with intentionality towards someone actually changed the way the double helix DNA strand coils and uncoils. And this goes for both positive and negative emotions and intentions.” [2: p111] Actually, the experiment was based on faulty assumptions, and so full of flaws in their methodology and analysis, that it could show nothing at all . All it could prove was that Dr Leaf was so desperate to grasp hold of anything that seemed to support her theory that she was willing to use a twenty-year-old study from a group of pseudoscientists that also believe in occult practices like ESP and telekinesis (http://psychotronics.org). The concept that we have a soul that’s separate to, and controls our brain, is called dualism. Modern science gave up on dualism a long time ago. While psychological sciences have been slower to give up on the idea of our thoughts as influential, no credible scientist still holds on to the idea that we have an ethereal force that controls our biology. Dualism is untenable both scientifically and philosophically . The reality is the exact opposite to what Dr Leaf teaches. Our brain is responsible for all of the functions that are traditionally associated with the mind/soul/spirit. For more in depth information, please see my essay: Dr Caroline Leaf, Dualism, and the Triune Being Hypothesis. 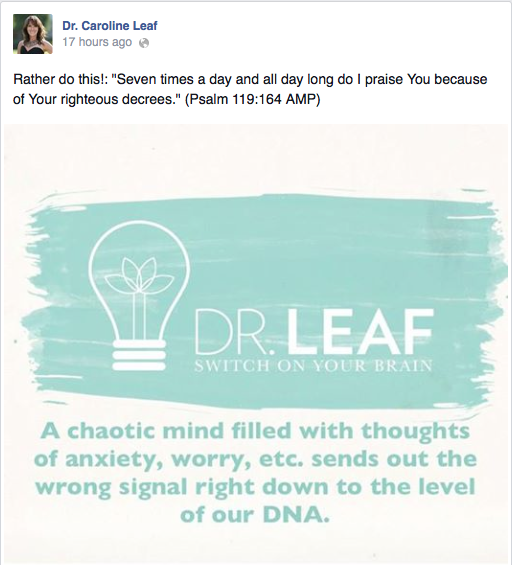 Therefore, a “chaotic mind filled with thoughts of anxiety, worry, etc” doesn’t send signals down to our DNA. It’s our DNA and the many steps in it’s expression, and the interaction of our biology and our environment, that then causes our minds to be worried, anxious, chaotic etc. Dr Leaf is welcome to hold any view she likes, but she cannot claim to be a cognitive neuroscientist while holding a view that is directly contradicted by actual cognitive neuroscience. Nor should she be welcome to speak as an expert when she clearly is not one. For the sake of her audiences and the Christian church as a whole, Dr Leaf needs to revise her teaching and bring it into line with the facts established by real cognitive neuroscientists. Rein, G. and McCraty, R. Local and nonlocal effects of coherent heart frequencies on conformational changes of DNA. in Proc. Joint USPA/IAPR Psychotronics Conf., Milwaukee, WI. 1993. Bunge, M., The Mind-Body Problem, in Matter and Mind. 2010, Springer Netherlands. p. 143-57. This entry was posted in Biological, Caroline Leaf, Psychological and tagged anxiety, bible, brain, caroline, caroline leaf, caroline leaf criticism, cognitive, cognitive neuroscientist, criticism, DNA, dr caroline leaf, Dr Leaf, dualism, ESP, Facebook, heartmath, Leaf, neurobiology, neuroscientist, occult, paranormal, pseudoscience, psychology, psychotronics, stress, telekinesis, thought, toxic thought, worry by cedwardpitt. Bookmark the permalink. It sounds like you don’t like religion, which supports the dualism idea you mentioned above. That’s fine. But don’t reject powerful truths for the sake of your dislike of religion. What I get out of her above post is that she is promoting positive thinking, rather than focusing on all the worry. Hasn’t positive thinking been scientifically proven to have a positive impact on health and disease processes? Look it up. Lots of research on it. For example, Jesus once said, “Who of you by worrying can add a single hour to your life?” (Matthew 6:27). He then gives a practical recipe for letting those worrisome thoughts go. Sure it is a spiritual recommendation on his part, but it accomplishes positive results. I have heard the analogy that worry is like a rocking chair. You feel like you’re doing something, but you’re not getting anywhere. Look up the treatments that science has produced to cure people of anxiety and worry and a multiplex of other mental disorders. A lot of the treatments are focused on cognitive therapy – helping people understand their thinking errors and change how they think. In the case of worry, the thinking error is that a person assumes that they can control the world around them by worrying. In reality, they cannot. So the person has to learn to give up “control” and accept the world as it is before they can give up the worry. In this instance, science is not saying anything new. It is really only confirming what a religion (specifically Christianity and Jesus) said over 2000 years ago. When it comes to psychology and neuroscience, the practical wisdom on how to relate to others and to oneself from religion is actually a very valuable resource. Don’t throw out the baby with the bath water. Just because you do not like religion does not mean that you can throw out all the good things that religion brings to society. Also, perhaps you should consider that neuroscience and psychology are still in baby stages. We have so much to learn still. Humanity is still humanity. People still murder, steal, lie, cheat, and worry. But people also still love, respect, cherish and have families. Nothing is new. Just our understanding of human nature is being renewed every day. Science is not the answer to everything. It is simply a tool to help us discover our world. And because science is controlled and managed by people, it is prone to error. Just because someone did a study does not mean that it applies in every situation. It does not mean that the researchers were not biased. Good science actually takes into account hundreds, if not thousands of studies, before coming to a conclusion. Anything else is pseudoscience. Don’t throw out practical wisdom just because you think it is not supported by one scientific study. Find out for yourself if it works or not in the real world. Then decide for yourself whether the science is valid or not. I can give you an example Dr. Leaf’s suggestion actually working in real life. When I was a kid and complained about having spaghetti for dinner, mom would tell me to go out of the kitchen where she was cooking and then come back in and say “Praise God we are having spaghetti for dinner.” I would mumble it, still disgruntled. She would tell me go back out and come back in and say it again. So I would and this time I would be not so grumbly. After three or four times of having to do this, we would end up laughing together and making a joke out of it. And oddly enough, I wouldn’t feel so disgruntled about spaghetti. Yes, it’s just a little example, but it is an actual event that happened to me lots. Perhaps, if you are a believer, you might say that the positive result was because God supernaturally interviened and gave me joy. Perhaps, if you don’t believe in that stuff, you might think that it was the power of positive suggestion that put me in a better mood. (I believe you can find scientific research that supports the power fo positive thinking). I don’t care what you call it! It simply worked. For that reason, I will continue to use this tool. Just as I continue to use science as a tool. Anyway, wish you well and God bless your endeavors and life. I’m sorry if I’ve given you the wrong impression. I love God and my passionate critique of Dr Leaf’s work is born of a desire to see the Christian church excel in their care of those with mental health issues, and to be discerning in regards to scientific wisdom. The post on which you have commented, “Dr Caroline Leaf and the cart-before-the-horse conundrum”, discussed the errancy of Dr Leaf’s statement that our mind changes our DNA, when modern neuroscience clearly shows the complete opposite. My discussion on dualism was to further expound on Dr Leaf’s error – her fundamental belief is that our mind is separate to and controls our brain, a belief that is born out of the underlying assumption that our soul is separate to our body, and in control of our body, i.e. : dualism, or in Christian parlance, the triune being theology. However, I don’t think the Bible supports Dualism at all, and neither does science. I have discussed the Biblical and scientific evidence for and against the Triune Being Hypothesis extensively in my essay on the subject (https://cedwardpitt.com/2014/07/25/dr-caroline-leaf-dualism-and-the-triune-being-hypothesis/). I appreciate your impassioned defence of Christianity. Like I said earlier, even though I’m not the typical Christian blogger, you’re preaching to the choir. However, we’ll have to agree to disagree on some things. For a start, I’d suggest that there’s a paucity of evidence for positive thinking in health and psychology. There is good evidence for acceptance in psychology, and there is evidence for positive reinforcement as a learning tool. But repression of negative thinking or trying to replace negative thinking with positive thinking is not helpful. If you want more information on this, please review chapter 2 of my book (https://www.smashwords.com/books/view/466848), or for a more digestible presentation on why changing your thinking is a poor way of managing your actions/behaviour, please watch the TEDx talk by Dr Alan Watkins (https://www.youtube.com/watch?v=q06YIWCR2Js). As Watkins demonstrates, and I have discussed in my book, thought is a function of several underlying processes, all dependent on the brain. As such, the ideas that the mind changes the brain and the mind changes matter, both advocated by Dr Leaf, are simply non-sensical. I agree that good science does not take any one study as gospel, but that scientific truth is discovered in the independent replication of the same result. However, if anyone is guilty of the single-study-syndrome, it is Dr Leaf. I would encourage you to review Chapter 10 of my book to see how Dr Leaf arrives at one of her teachings most fundamental assumptions. We need good science because what you or I may assume to be practical wisdom may be shown to be both impractical and unwise in the cold light of scientific testing. Hence, my interest in the work of Dr Leaf, which I contend is both poor science and poor theology. However, it’s up to each individual to consider the evidence for themselves and to make up their own mind. Thank you for that very tactful and appropriate clarification. To be honest, I haven’t looked deeply into Dr Leaf’s work. You raise some interesting points to ponder. The above clarifies a LOT. Thank you! Hi Jess. You sound ignorant and naive. Good for you if you feel that Dr Leaf’s ‘ways’ appear to be helping you. You’re welcome to believe whoever you want. As for me, I’ll continue to promote good science, because if it wasn’t for rigorous scientific critique, people would still be trying to cure tuberculosis with blood letting. If in the process of exposing Dr Leaf’s scientific and scriptural flaws I’m perceived by some as a ‘ranty raver’, I’ll happily live with that. Thanks for your comment, and all the best to you.